Description: Beautiful full-colour example of one of the earliest commercially available maps of the Magellan Straits. Inverted so that Tierra del Fuego is the landmass at the top of the page. Original hand colour. Description: The Straits of Magellan and Tierra del Fuego. Published as part of Hakluytus Posthomous or Purchas his Pilgrimis, contayning a History of the World in Sea Voyages and Lande Travells, by Englishmen and others. Coloured. Description: Magellan Straits. Striking 'Dutch Golden Age' map decorated with sea monsters, ships, and a pair of Magellanic penguins, spotted by Ferdinand Magellan in 1520. Original colour. Description: Beautiful and early map of the Straits of Magellan based on the surveys by Spanish, Dutch and English mariners. Coloured. Description: Stunning chart of the Magellan Straits, Tierra del Fuego or Magellanica and the Le Maire Straits. Original colour. Description: Magellanica. Miniature map with text. Coloured. Description: Magellan Straits. Detailed map of straits. Coloured. Description: Le Maire Straits. Coloured chart of the Straits. 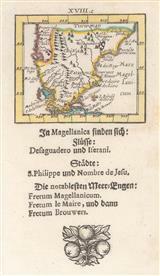 Description: Elegant sea chart of the Magellan Straits, with detail of the islands, ports and bays. Coloured. Description: Detailed hydrographic survey based on Byron, Wallis and Carteret. Description: Le Maire Straits. Two maps on one sheet and an series of coastlines showing this region. Coloured.